The project, a flagship programme of the BJP-led government in the state, saw Prime Minister Narendra Modi lay the foundation stone for the memorial and a ‘jal poojan’ in December 2016. In a bid to bring down the cost of constructing the proposed statue of Chhatrapati Shivaji in the sea off Mumbai, the Maharashtra government has tweaked the design so that the height of the warrior king is now 7.5 metres shorter than originally proposed, although the sword he wields will be taller than in the original design. Documents accessed by The Indian Express under the Right to Information (RTI) Act show that the state government had originally proposed a statue standing 121.2 metres tall, including the sculpture of the king on his horse together measuring 83.2 metres, and a 38-metre sword. The equestrian statue is to be cast in bronze on a pedestal, designed as a multi-storey structure, standing 88.8 metres tall. In total, the project height was 210 metres. This year, as part of cost-reduction measures on the project, the height of the sculpture of the warrior king on his steed has been reduced to 75.7 metres and the length of the sword raised to 45.5 metres, maintaining the statue height of 121.2 metres. 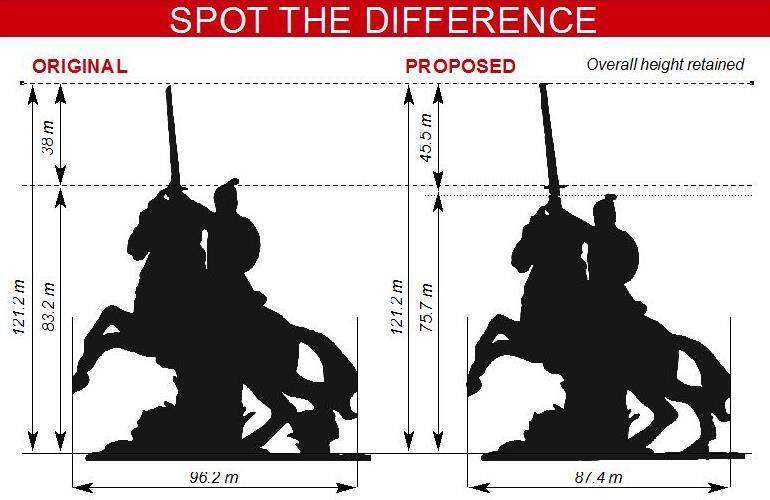 As part of cost-reduction measures on the project, the height of the sculpture of the warrior king on his steed has been reduced to 75.7 metres and the length of the sword raised to 45.5 metres, maintaining the statue height of 121.2 metres. The original base length of the sculpture was also proportionally reduced to maintain the aesthetic view of the statue. This has resulted in reduced anticipated use of bronze, tertiary steel elements and armature. Overall, these changes and a few others have led to a cost reduction of Rs 338.94 crore. 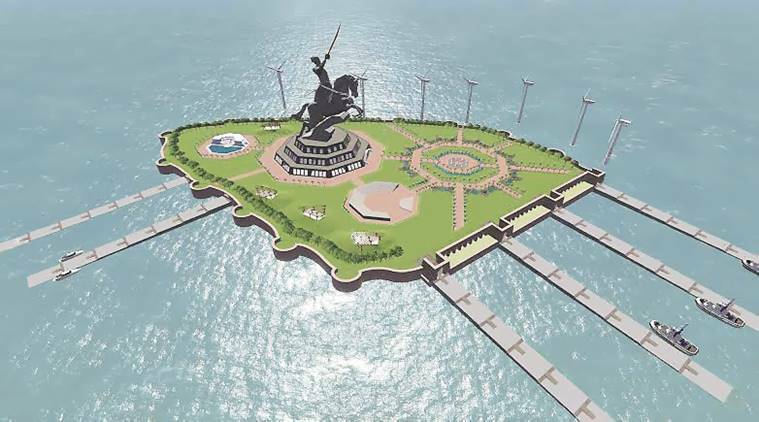 A week after the government issued a Letter of Acceptance for the project to Larsen & Toubro, opposition parties had alleged the state government had reduced the height of the Shivaji statute in order to cut costs, while increasing the pedestal height. The government denied the allegations, maintaining that the height of the statue remains 121.2 metres. “I have written to the consultant, the contractor and PWD officials asking for a presentation on how cost reduction has been achieved,” said Vinayak Mete, legislator and Chairman of the Project Implementation and Monitoring Committee for the Chhatrapati Shivaji Maharaj Memorial. Meanwhile, the state government last month decided that the total height of the project would be 212 metres, making it the tallest statue in the world. The equestrian sculpture portion will now be made proportionately taller by 2 metres and a proposal submitted to the MoEF for clearances, said sources in the PWD. On March 1 this year, the state government issued a Letter of Acceptance to L&T for the project worth Rs 2,500 crore plus GST, taking the total project cost to Rs 2,800 crore. In December last year, the government decided to go in for cost optimisation measures to reduce the total project cost from Rs 3,826 crore, the sum originally quoted by L&T. Various cost optimisation measures have led to cost reduction to the tune of Rs 1,026 crore. Records show that apart from cost reduction in the statue itself, cost has also been reduced in other ways. The government has, for example, deferred the first year operation and maintenance and training cost of the project. Some deleted items include a VIP jetty and a safe house for VIPs. The marine works broadly comprise breakwaters, island reclamation, a sea wall designed to appear as a historic fort wall, a passenger jetty, etc. The pedestal will house various visitor management spaces, a museum and art gallery, food court and viewing deck.